Arbequina Olives for sale. Buy online at Zingerman's Mail Order. Gourmet Gifts. Food Gifts. 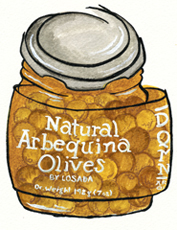 These small brown beauties are the olive of Catalonia, Spain, and a must for the olive lover in your life. Too small to be harvested by mechanical methods, the care and time it takes to hand pick arbequinas is a testament to their quality and reputation. Brownish purple in color, they have a unique nuttiness that makes them easy to devour by the handful, especially if you dress them with a bit of olive oil and orange rind. One jar might not be enough.